No-one approaches aging with enthusiasm. Activities we accomplish easily in our 20s and 30s become more difficult as we grow old but, though change is inevitable, recognising and understanding precisely what is happening to our bodies and minds allows us to continue to manage and enjoy our lives. Patrick Rabbitt is a cognitive gerontologist who has researched physical and mental aging for over 50 years and so can interpret his personal daily experiences of the aging process through a comprehensive understanding of what gerontological research has revealed about how our bodies and brains age, and how these changes affect our everyday experiences and lives. 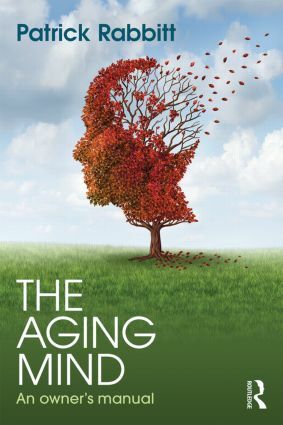 Engagingly written, Professor Rabbitt’s book is a fascinating account of why our sensory and cognitive experiences change as we get older, and what these developments mean for our overall physical and emotional well-being. Describing the latest research the book covers the mental changes that affect our daily lives such as those in memory, intelligence, attention, sleep, vision and hearing, taste and smell, touch and balance, anxiety, depression and perception of the passage of time. It also discusses how far we can keep and develop the skills we have mastered over our lifetimes. The book debunks unhelpful myths about the aging process and offers guidance on how we can age better. This is an absorbing account of the aging process from one of the most eminent gerontologists working today. Its warmth and candour make it an engaging and helpful guide for those interested in understanding their own, or their relatives’ ageing. Its rigour and comprehensiveness make ideal for students seeking an accessible alternative to standard textbooks on aging and for health professionals working with older people. Introduction 1. Talking About Old Age Part One – What is Aging? 2. Why We Age 3. How Fast Do We Change? 4. How Well Do We Understand What Is Happening to Us? 5. Bodily Signs Of Mental Changes Part Two – Memory 6. What is Memory For? 7. Remembering To Do Things 8. Who Said That? 9. Losing And Finding Words and Names 10. Remembering The Beginnings Of Our Lives 11. Remembering The Rest Of Our Lives Part Three – Senses 12. Seeing 13. Hearing 14. Taste and Smell 16. Fumbling and Stumbling Part Four – Intelligence, Skills and Wisdom 17. General Smarts 18. Keeping The Skills We Have Learned 19. Reading Others’ Minds 20. The Getting Of Wisdom Part Five – Living with Aging 21. Those Old Blues: Depression and Anxiety 22. The Speed of Thought 23. Paying Attention 24. Good and Bad Days 25. Sleep 26. Time Passing Part Six – Aging Well27. What Can We Do About All This? Patrick Rabbitt is Emeritus Professor at the University of Manchester, UK, and remains an active researcher affiliated to both the University of Oxford, UK, and the University of Western Australia, Australia. He is also Honorary Fellow of the British Psychological Society and the British Society of Gerontology and a Member of the Academy of Europe. Why not download our Routledge FreeBook Essential Skills for Wellness: Bolstering Your Daily Mental Health? This resource contains a chapter from The Aging Mind: An Owner's Manual, along with a wealth of other information on managing and improving your mental health.